Hey everyone! Today I'm guest posting over at With Luck Blog for Jenn while she's away on a service trip. Hop on over to learn more about how I pack for a short trip. I'm actually heading out of town for a long weekend this morning, and am really wishing I had picked up some of these pieces for the trip! I won't be posting tomorrow while I'm away, so have a great weekend! I'll be back on Monday. I am so in love with that swimsuit! These are great picks for a vacay! I love that maxi dress, it's so pretty! 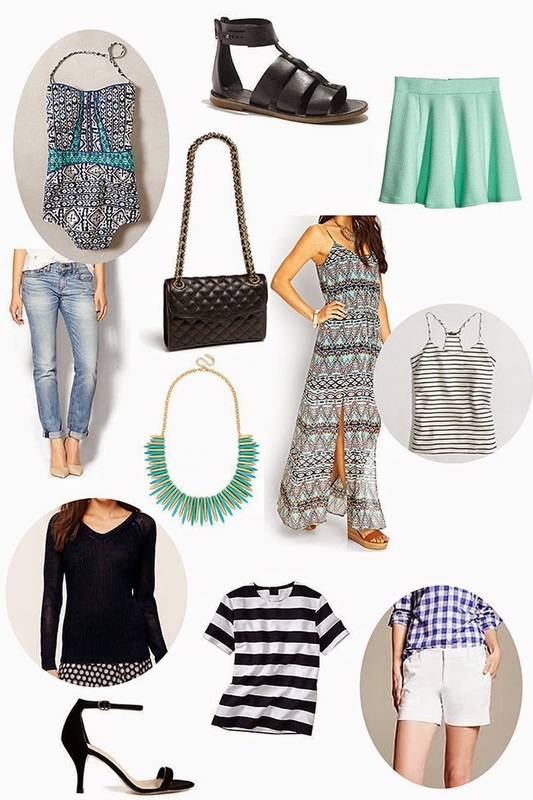 Want all of these pieces, especially the swimsuit and mint skirt. So cute! The pattern on the bathing suit and maxi dress is gorgeous. I'm headed there now to check your post out! Thanks Yi-chia, I love it too!